Hoy, hoy! How are you feeling now? Has the bloating subsided a bit? Same here. This is your short, end-of-year letter from a bluff-dwelling troglodyte, your old friend from the Ozarks. The research week begins at Hogeye, AR, a place where the Phillips part of my family settled in the 1800’s and incidentally (perhaps) the same place where the Illinois River is borned out from hundreds of little rivulets run down from the hills. They join together to become a force that flows north, crossing the Oklahoma border and turning back south again to bring verdant life to NE Oklahoma. 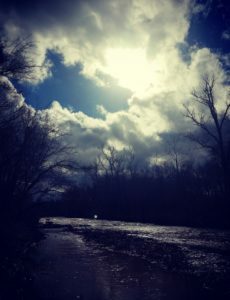 I like to think my Cherokee descendants saw the river after their bitter journey on the Trail of Tears and felt they’d found the closest thing to home for their family. After Hogeye it’s off to Noel, Eminence and Blue Springs, Missouri. There’s also some place called the Land Between Two Lakes in Kentucky I’m headed for, not because it is considered the Ozarks but because it was on the map and demanded to be seen. Then on to Adams, TN where a strange and disturbing occurrence happened to one poor family in the 1800s. It’s all over now but I’m curious to take a peek. I can’t help myself. All of this brings me around to The Big Date on New Year’s Eve. I’m supposed to rendezvous with a guy named John at the Opry that night. From the Illinois River to the Cumberland, it seems. My family is due to meet me there. Dear ole Dad said several months ago, “We all need to go see Prine before one of us drops dead.” We could not argue with his logic. 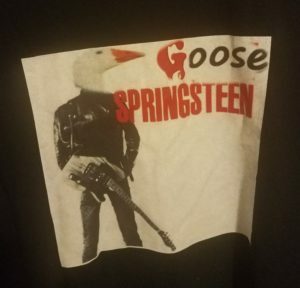 This is my question for you: is it ok to wear a shirt that reads “Goose Springsteen” on the front to a John Prine concert? What if my sister made it special for Christmas? I feel like Prine would get it. He has a fine sense of humor if his music is any indication. Wish me well on the road. If we see each other out there let us share a honk and a snog. Look here, we’re going to make it after all. I leave you with some Prine lyrics for to bake your brain casserole. I guess I’ll see you guys on the latter side of 18.